Whether it’s at happy hour, an evening out, or just a beautiful sunny day in the backyard, the margarita is my go-to drink for just about any occasion. It doesn’t have to be Cinco de Mayo for this classic cocktail to fit the bill. I thought I’d share the recipe I use for my perfect margarita. There’s rarely a time I don’t readily have all the ingredients on hand. From the looks of things, I think it might be time for me to restock. What’s your go-to cocktail for any occasion? Whether it's at happy hour, an evening out, or just a beautiful sunny day in the backyard, the margarita is the perfect cocktail for just about any occasion! 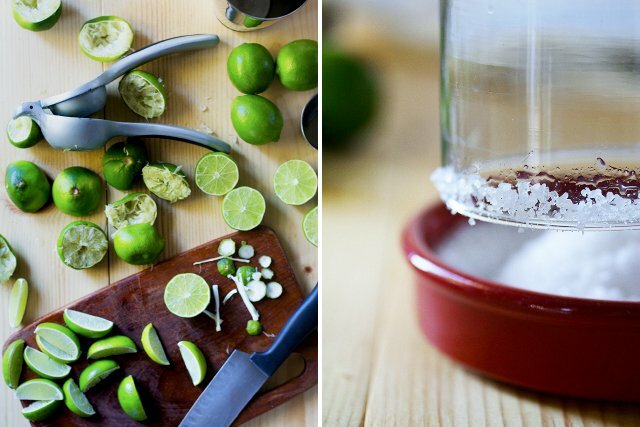 Cut a slit in a lime wedge and slide it around the rim of your glass, and dip into the coarse salt. The lime juice will act as an adhesive, allowing for the salt to stick to the glass. Feel free to only salt half the glass, or omit this step if you don't want salt at all. Add all the ingredients to a shaker full of ice. Give it an extra hard shake for a full 10 seconds so that your margarita is frothy and icy-cold. 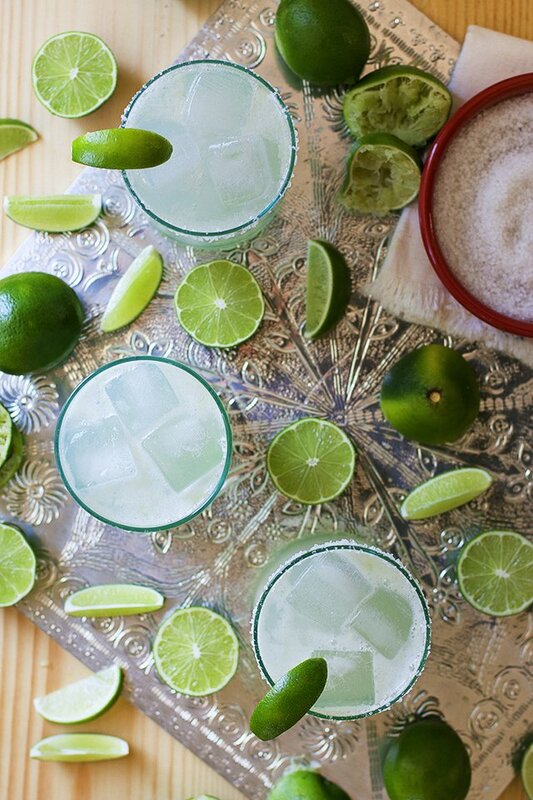 Strain over ice into your salt-rimmed rocks glass, and garnish with a lime wedge. This is the perfect margarita for my taste, but if you usually like things on the sweet side, try upping the simple syrup to 1/2 oz. If you prefer things extra tart, feel free to omit the simple syrup altogether. just posted about this – it goes perfectly with my post about Vegetarian Toastadas for Cinco de Mayo, YUM! This recipe is just like a “Mexican Martini” my husband has been making me for years. The only thing missing from the recipe is a splash of olive juice!! Absolutely love them!!! This is the very recipe that a lil Mexican rest on Captiva Iasland in SW Florida makes!! They use fresh limes and are the best margaritas ever!!! Am I the only one who notices that there is no tequila in this recipe? the universe bought me to this perfect margarita…..it was just meant to be!!! It’s summer time on the french riviera and cocktails are at my place!!! Substitute Agave Nectar for Simple Syrup. Agave Nectar is sweeter than Simple Syrup, so use less. As it is difficult to measure fractions of ounces, you might try doubling the entire recipe. You will certainly want a second and if you have a guest you will need at least four. Find Agave Nectar in most health food stores. I wil try this, looks like the perfect simple recipe. I spotted it on the Huffington Post, cool! Thanks for sharing this festive cocktail recipe! Would also like to know if there is a way to print just the recipe. Not at the moment Rich, but we’ll keep you updated if we add that feature. Thanks for reading!! Is there a way to just print the recipe? Not at the moment Bonnie, but we’ll keep you updated if we add that feature. Thanks for checking out the site!! Once I made a liter of icy strawberry margarita, put it in a thermos bottle and went to celebrate May 1st. I had the best drink in that party, that’s for sure. NOTHING beats a good margarita. and my husband makes awesome simple syrup, so i can’t WAIT to try this concoction. YUM! 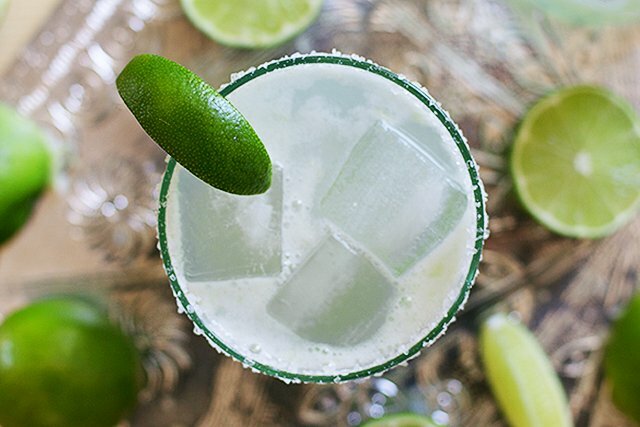 I love a good margarita and the pictures in this post and the description of this yummy drink are seriously making me consider running to my kitchen and whipping one up right now! Thanks for the inspiration!! 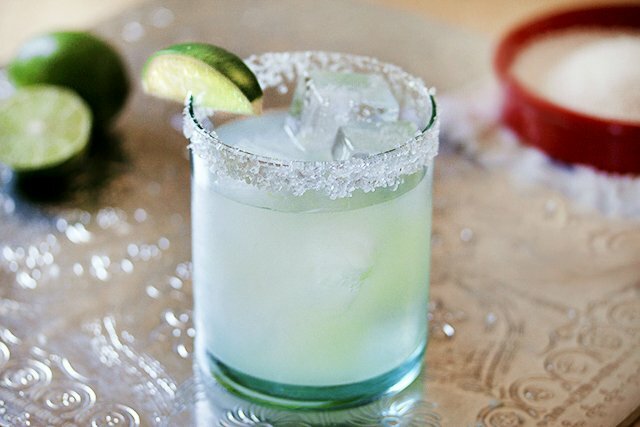 This margarita is perfect for spring. It’s Friday after 12, and I could really go for one of these right now! Alas, somebody scheduled an afternoon meeting! As an avid fan of agave spirits, I find margaritas typically hide the flavour of tequila..not in this case. A perfect blend that accentuates the Agave perfectly with sweet and sour notes. Yet another fantastic mix! You guys really have a way of making your food and drinks look super appetizing. This margarita sure does look perfect. 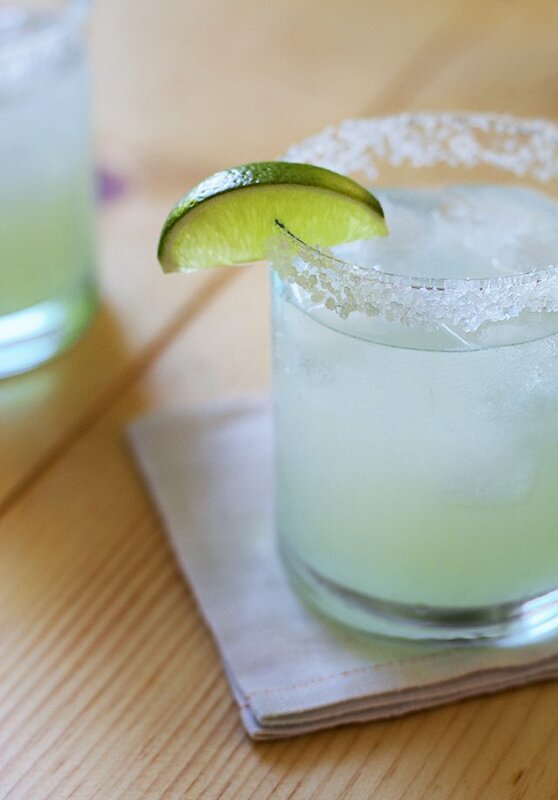 Not sure why I’d ever need a margarita mix when this is so simple to make! One of my favorite drinks to have after a really hard, rigorous workout is a margarita. Nothing quenches the thirst like the salty, tart flavors of this amazing cocktail. A favorite memory of mine is when a group of friends and I completed a 200-mile relay run, sitting in a Santa Cruz bar post race, drinking pitchers of margaritas. Amazing! This, sir, is on my menu for this afternoon! Kudos and love your site!! 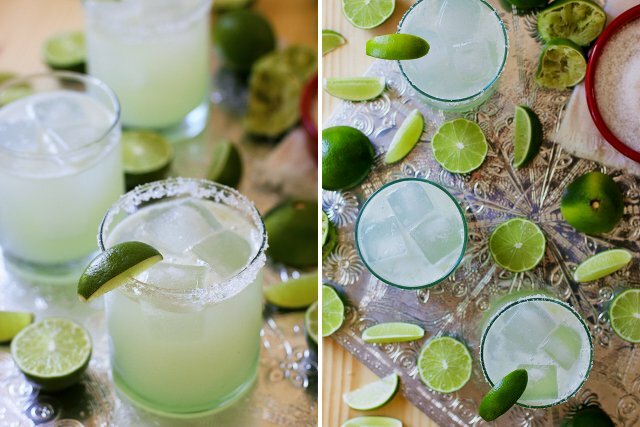 Love a good margarita, but have never attempted one at home. This recipe seems right up my alley, not too sweet but not too tart as well. Quinn, you have to try one at home. Super easy!! national margarita day 2015 – Cody, Uncorked. Summer Cocktails / Blog / Need Supply Co.
Margarita Perfection | The Perfect Margarita | stupidDOPE.com | Daily Magazine for Music, Fashion, Travel, Art & More!